Be the first to share your favorite memory, photo or story of Toni. This memorial page is dedicated for family, friends and future generations to celebrate the life of their loved one. 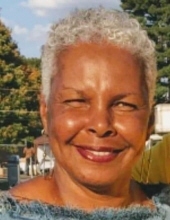 Toni Vanese Warren, 66, passed away on Thursday, April 03, 2019. A native of Frankfort, she was born on January 23, 1953 to the late John and Louise Washington Warren. She worked for the Virginia School System as a Teacher’s Assistant. She is survived by her daughter, Fatima Warren, Lexington. Gathering of Family and Friends will be held from 8:30am until 10:30am on Saturday, April 6, 2019 at Clark Legacy Center, Versailles Rd. Memorial service will follow at 10:30am on Saturday, April 6, 2019. Pastor Gloria Smith will be officiating. In lieu of flowers, memorial contributions may be made to Shriner's Medical Center, Development Department, 110 Conn Terrace, Lexington, KY 40508 in Memory of Toni Warren. To send flowers or a remembrance gift to the family of Toni Vanese Warren, please visit our Tribute Store. "Email Address" would like to share the life celebration of Toni Vanese Warren. Click on the "link" to go to share a favorite memory or leave a condolence message for the family.